He is an own son of the great Fire Water Flit, whose offspring have won over $2 million in barrel racing. He was bred and raised right here on our ranch in eastern Oregon. His willing attitude and great work ethic lendthemselves well to ranch life, where he is put to work right along with the other ranch horses. 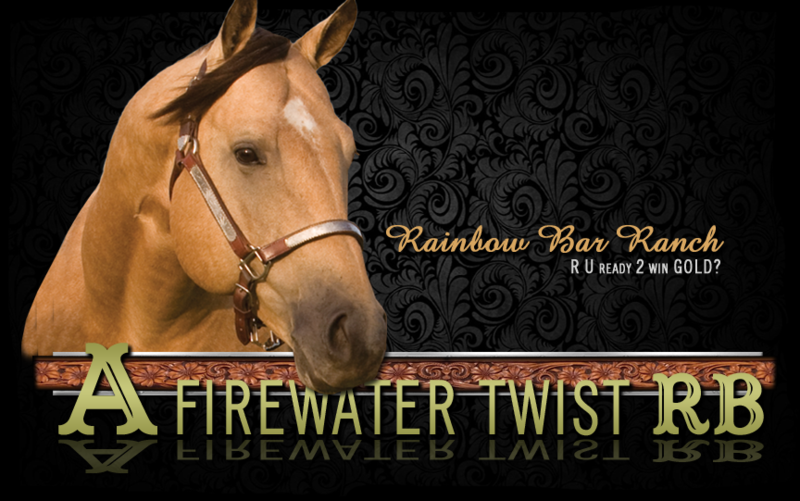 A FIREWATER TWIST RB brings an outstanding pedigree to the breeding shed. By Leading Sire of Sires and Leading Performance Sire FIRE WATER FLIT whose own progeny have banked more than $2.1 Million to date (not including WPRA earnings), with BFA Super Stakes Slot Champion MISS JB 055 ($173,784), SIX MOONS FIREWATER ($156,902), and Speedhorse Derby Champion / NFR Qualifier & Finalist FIREWATER FIESTA ($121,103, not including WPRA earnings), among his top money earners.